These sweet and spicy homemade onion rings are the ultimate appetizer or game day treat. Whip up a batch this weekend! Mix mayonnaise, barbecue sauce and chipotle powder until thoroughly combined. Refrigerate until ready to serve. Peel onions and slice into 1/2-inch thick rings. Separate rings, keeping 2 together for each onion ring to help keep the shape and provide a thicker onion ring. Use larger rings and save remaining for another use. Microwave onion rings for 30 seconds on high and allow to cool. Combine honey, sriracha and soy sauce in bowl large enough to dip rings. Reserve 1/4 cup glaze in separate bowl. 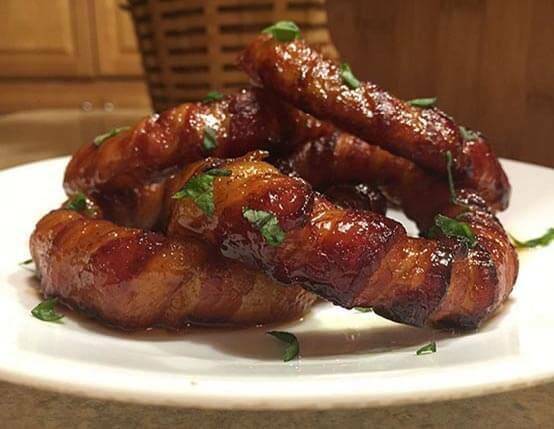 For each ring, wrap bacon all the way around, tucking ends of bacon into last wrapped section. Use about 2 pieces of bacon per ring, securing end with toothpick if necessary. Dip each ring in glaze and place on large baking sheet lined with parchment paper. Bake for 35 minutes, flip onions over and bake another 25 minutes, or until bacon is crispy. Watch closely as bacon will brown quickly toward end. Remove from oven and allow to cool slightly. Using a pastry brush, brush rings with reserved glaze. Garnish with chopped cilantro, and serve with Smoky Chipotle Dipping Sauce.